It’s not difficult to appreciate the beauty, vastness, and intrigue of the Great Lakes from the surface. But it takes a subsurface dive to truly begin to unravel the mysteries they hold. With the Great Lakes Research Center’s fleet of subsurface vehicles, researchers can do so much more than simply scratch the surface; they dive 1,000 feet to the bottom of the lakes, explore underwater topography, and even map subsurface features in three dimensions. The GLRC’s subsurface fleet consists of four vehicles—each with its own specialties and cutting-edge technologies. ROVs let researchers peek below the surface—often many hundreds of feet—without ever leaving the shore or their research vessel. ROVs are controlled by an operator who dictates the vehicle’s movements and functions remotely. The Outland 1000 ROVs are designed for light-to-medium work tasks and selective sampling. One vehicle, with 1,000 feet of tether, is designated for use on the RV Agassiz while the other is available for remote applications and carries a 500-foot retractable cable reel. An additional 1,000-foot cable is also available for very deep dives. The GLRC also offers a light-duty VideoRay ROV, capable of acquiring underwater video with lighting at up to 250 feet of depth. This technology gives researchers an underwater eye—perfect for exploring the depths of the Keweenaw Waterway or deeper areas of the Great Lakes. AUVs offer the ability to survey, explore, and collect data without requiring input from an operator. 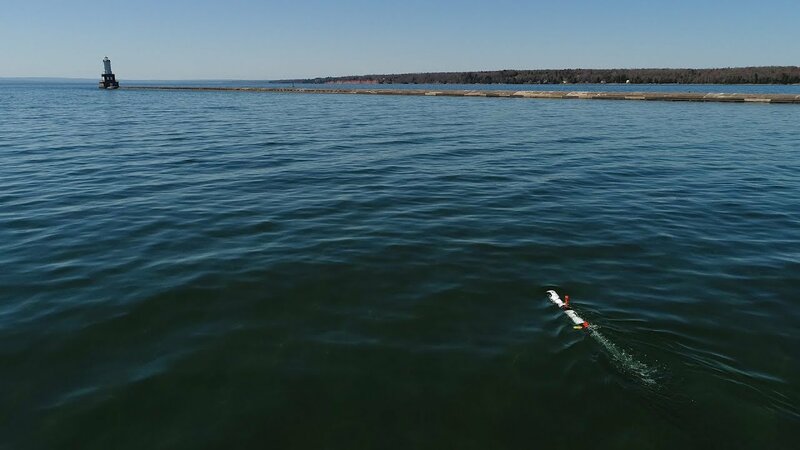 By controlling their movement themselves, AUVs give researchers a new way to study the Great Lakes—with no need for human control. The IVER 3’s sonar system uses a broad range of EdgeTech side-scan sonar frequencies (600 and 1,600 kHz), making it a very versatile sonar imaging system. The ultra-high-resolution EdgeTech sonar provides unrivaled imaging resolution and full three-dimensional mapping capabilities. The use fee for the 2018 field season is $70.00 per hour. Guy Meadows, director of the GLRC, discusses subsurface explorations.